These ribs were pretty much spot on with how my mom's version tastes. I would have made my mom's version but she rarely gives me any measurements and well, she's enjoying her retirement on the other side of the world at the moment. I certainly didn't want to spend precious phone time trying to get a recipe I know she won't give over the phone. However the recipe reflected in Saveur Magazine was a great substitution. The ribs came out perfectly balanced with sweet and savory, even if it didn't have that distinct red color found at Chinese restaurants. The recipe did call for food coloring but I omitted it since it really wasn't necessary or added any flavor. Rather than using whole ribs, I had my butcher cut the ribs into smaller pieces. Either way, it's a great recipe to make at home if you're craving Chinese take out! Whisk together hoisin, soy, sherry, garlic, sugar, and spice powder in a large bowl. Add ribs; toss to coat with marinade. Set aside, covered with plastic wrap, to let marinate at room temperature for 1 hour. Heat oven to 350°. Arrange a baking rack on top of a rimmed, foil-lined sheet pan. Remove ribs from marinade (reserve marinade); arrange on the rack, meat (not bone) side up. Place pan on middle rack of oven; pour in enough water that it reaches halfway up the sides of the pan, making sure the water does not touch the ribs. Bake ribs for 35 minutes. Baste ribs with reserved marinade; flip and baste again. Bake for 35 minutes more. (Add more water to pan if it dries up.) Raise heat to 450°. Flip ribs again; baste with remaining marinade. 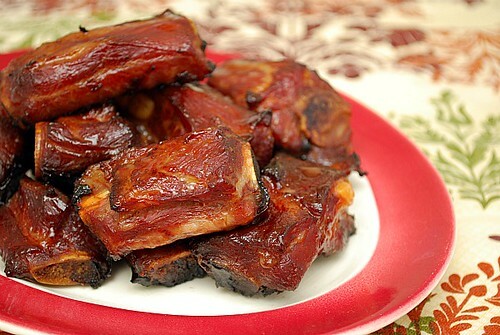 Continue baking until ribs are glazed, browned, and tender, about 20 minutes more. Serve with Chinese mustard or duck sauce, if you like. We had something very similar last night and it was amaaaazing. We raise our own beef just for ourselves so it was all organic and lad-de-da, so it was fun! Your picture looks gorgous! Yummy, I love this spare rib idea.